Take some time to read this great story. 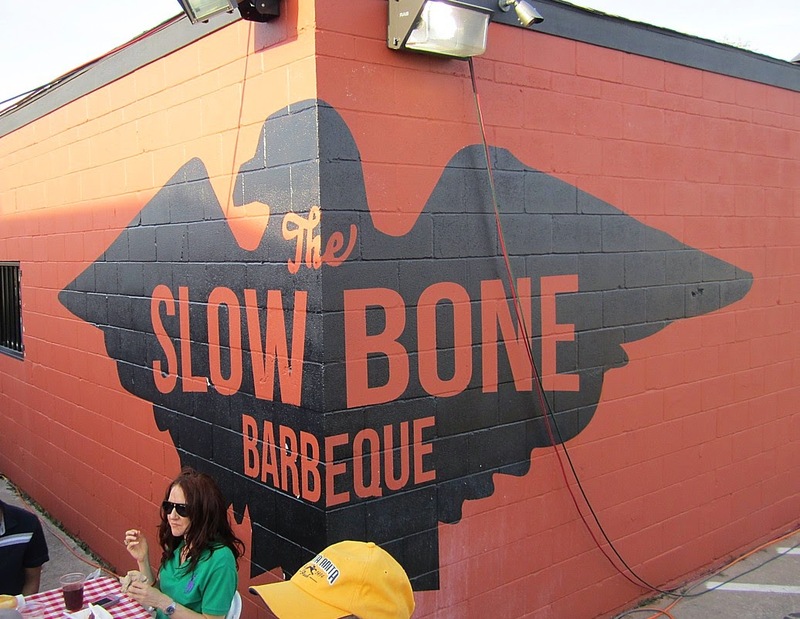 Their new Deep Ellum location opens tomorrow. I have no doubt it will be a huge success. 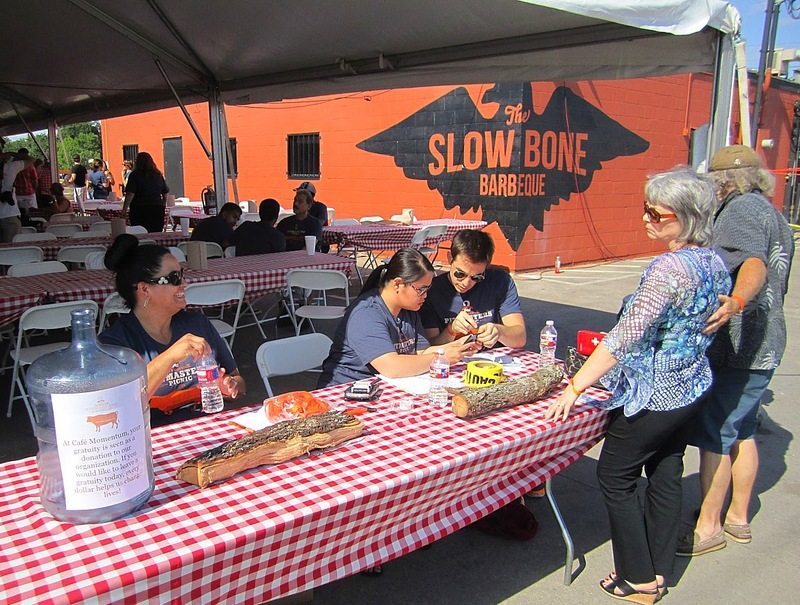 This is the second annual pop-up restaurant benefit for Cafe Momentum hosted by Jack Perkins at Slow Bone BBQ in Dallas. 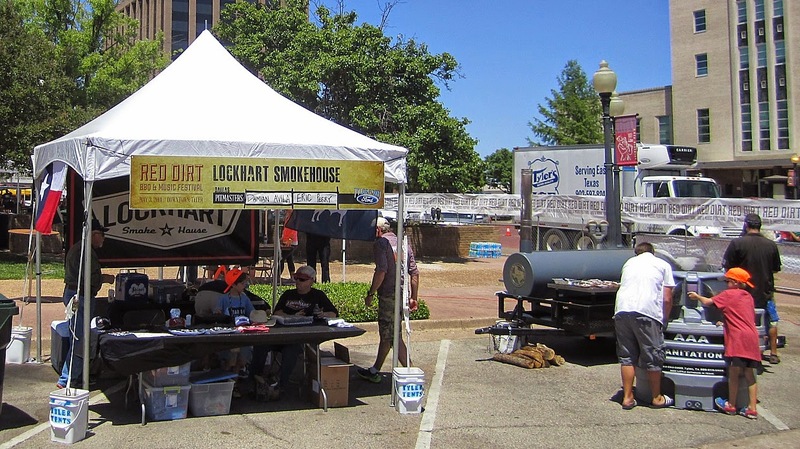 This one featured some fine pitmasters including Justin Fourtin from Pecan Lodge in Dallas, Stephen Joseph from Riverport BBQ in Jefferson, Nick Pencis from Stanley's Famous BBQ in Tyler, Wayne Mueller from Louie Mueller BBQ in Taylor, along with Jack and his crew from Slow Bone. This year's show was limited to 300 patrons and sold out in less than 36 hours. 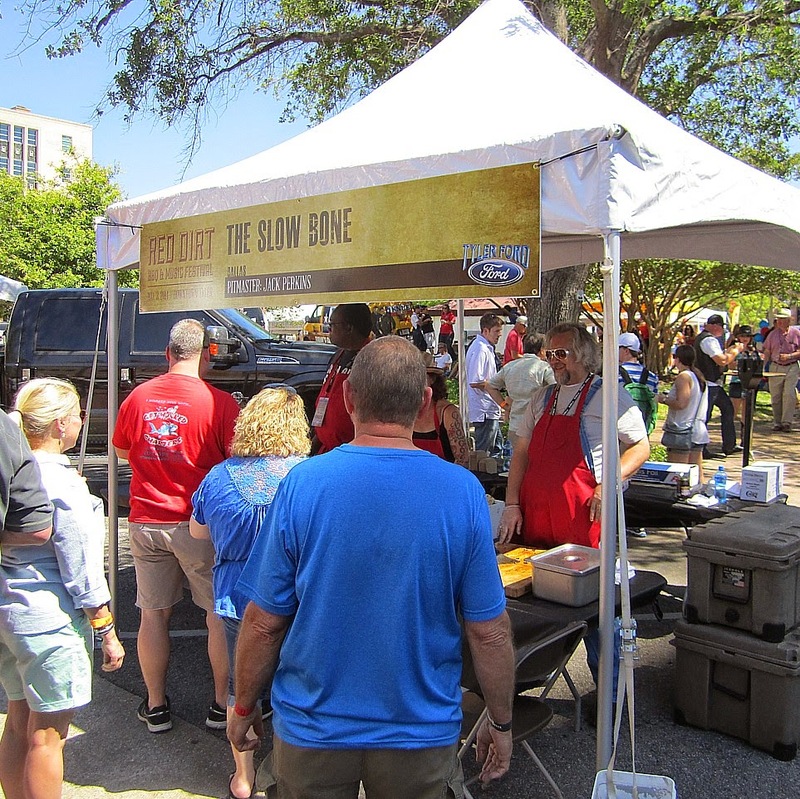 My guess is it will go faster next year because the food was outstanding. 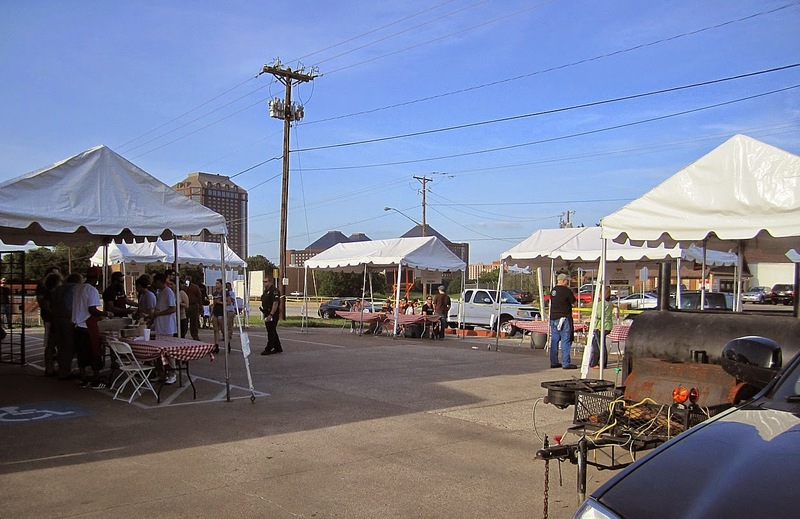 There was a large tent for eating and socializing along the north side of Slow Bone and the serving tents were set up along the south side. 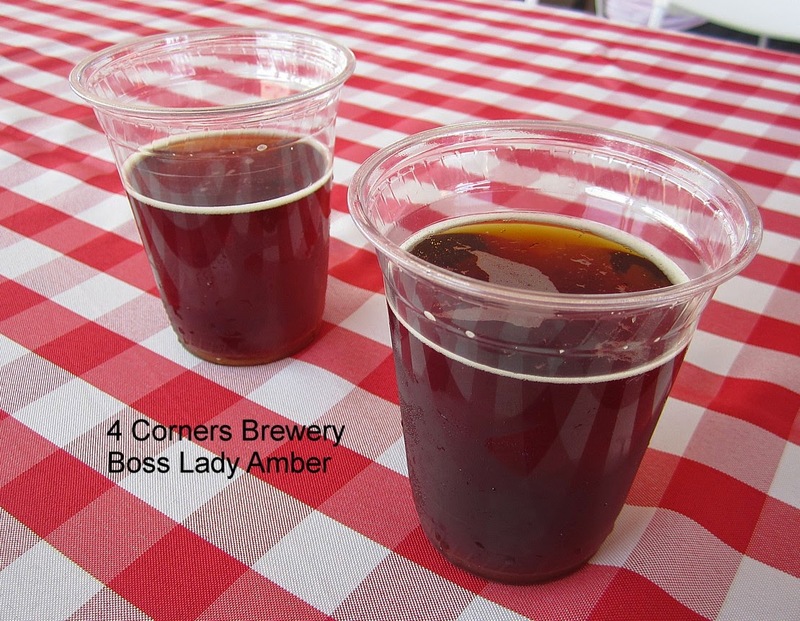 Four Corners brewery served some of their excellent suds to go along with the Q and an Allman Brothers tribute band, the Almost Brothers, played some 70's rock to go along with the food. 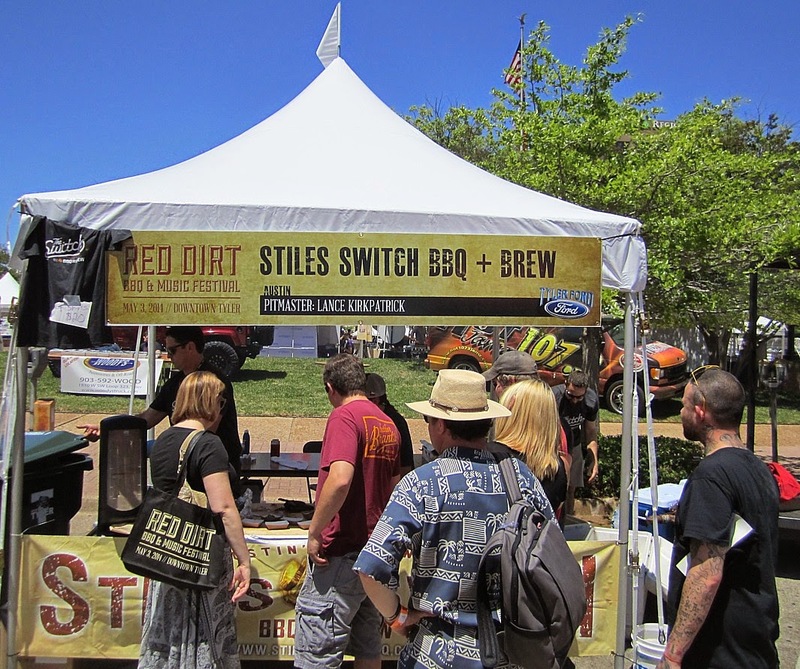 Since this was a fairly small event and the lines for beer were long, the waits for Q were never very long. 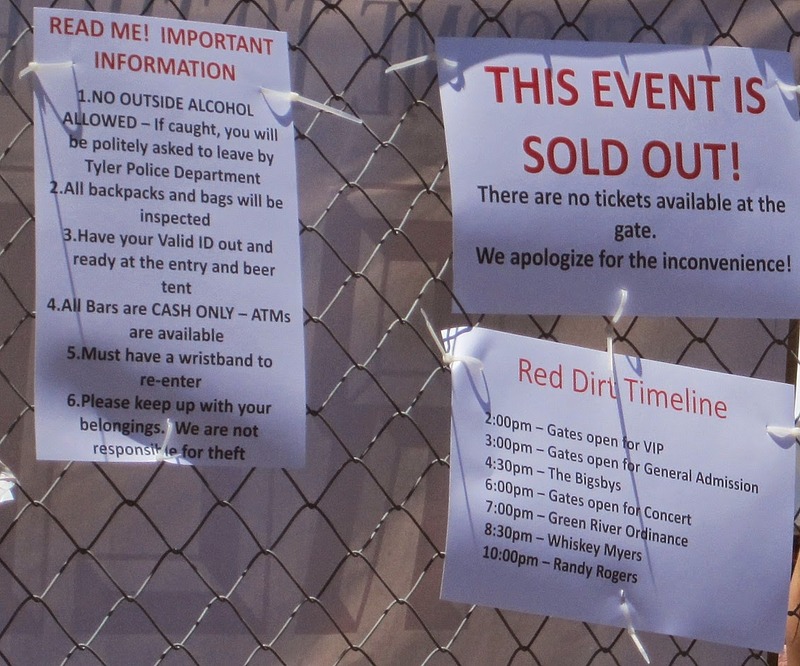 Mainly because a lot of people were in line for beer. 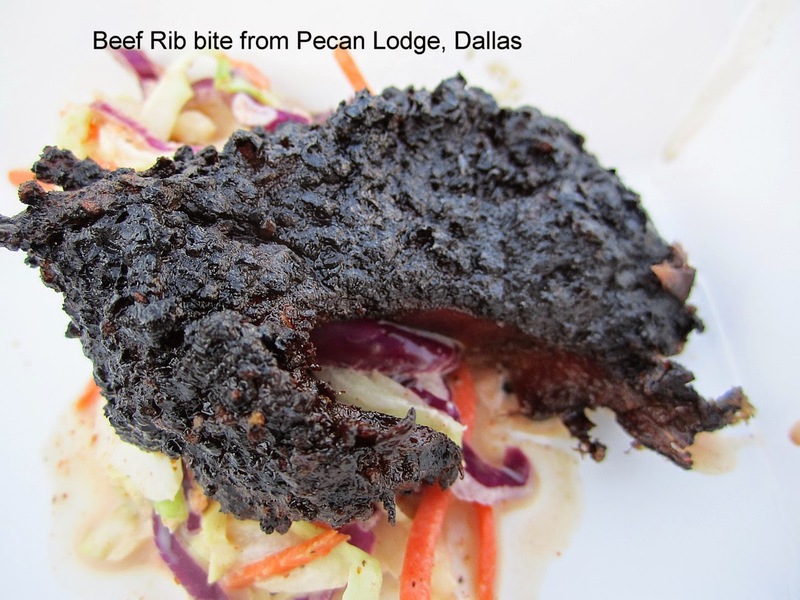 Food service kicked off about 5:45 and I started out with some beef rib from Pecan Lodge. Justin just slid the bone right out and chopped up small bites for everyone. Succulent and tender with awesome smoke flavor. 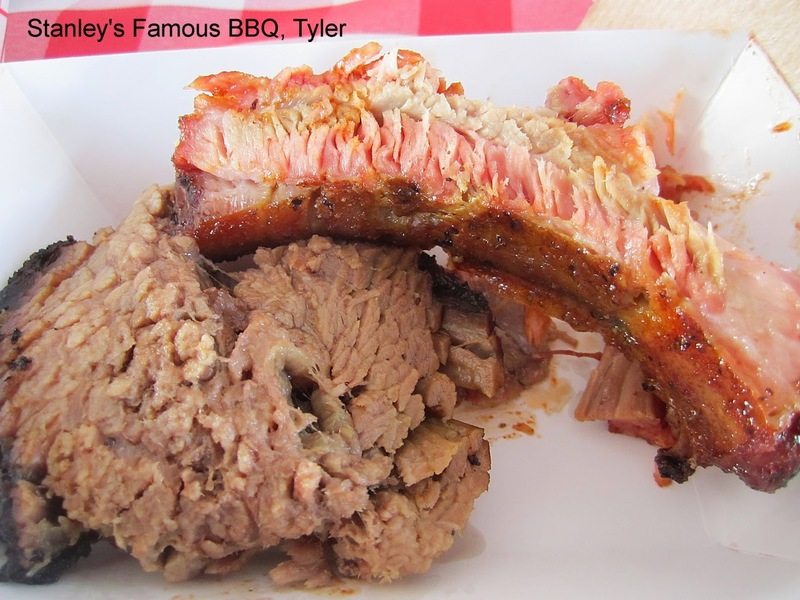 I headed to Stanley's next and got an awesome pork rib and some wonderful brisket. 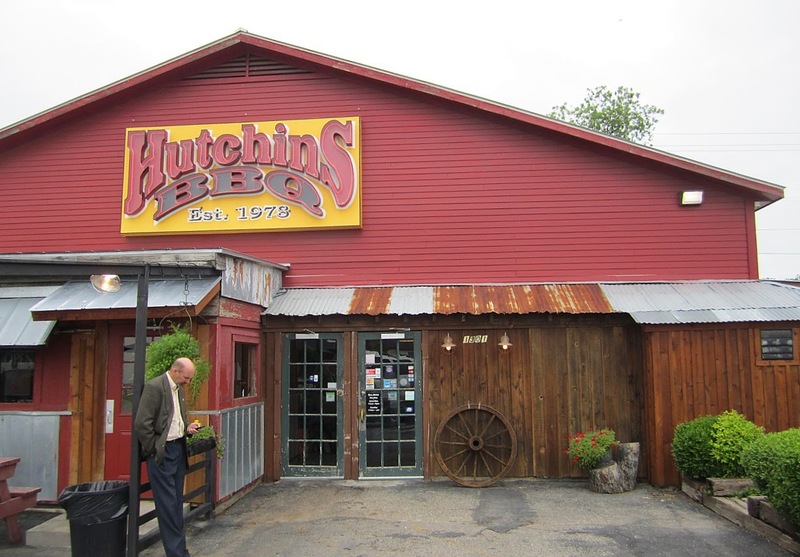 Scott and I will be visiting there again in June for a full meal. I'm looking forward to that. 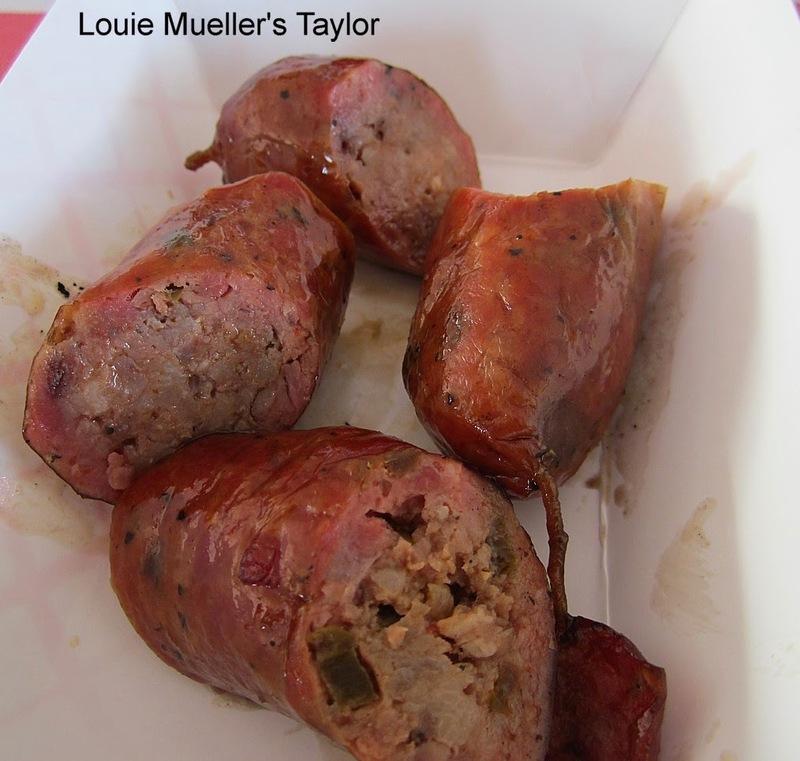 On to Louie Mueller's next where Wayne was serving up some of their excellent sausage. 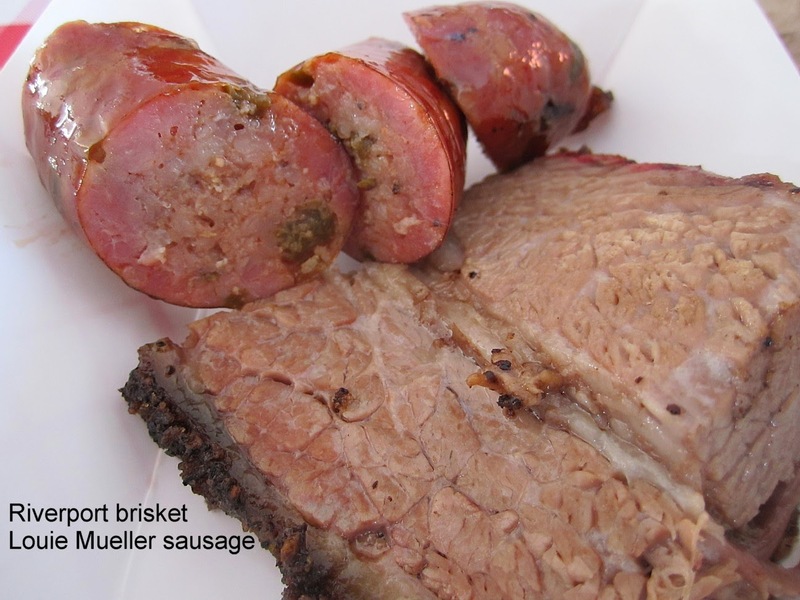 Always a treat, though I was hoping they would have some of that nice peppery brisket, too. 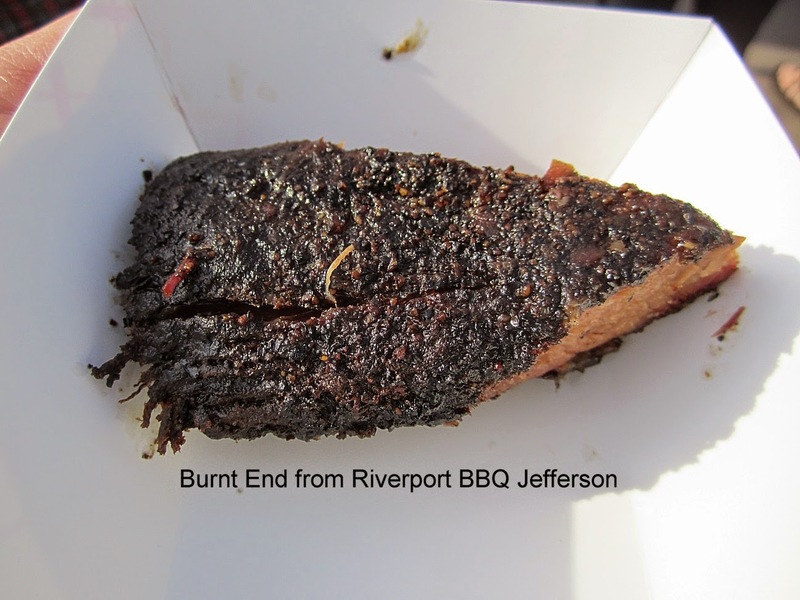 Riverport BBQ was next and they were serving brisket and pulled pork. 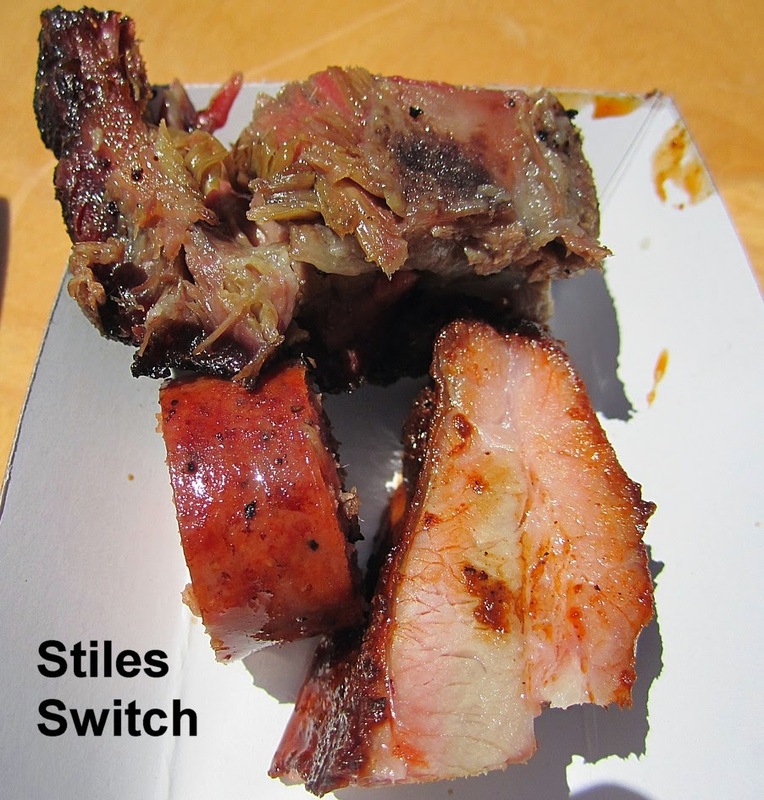 They sliced off a burnt end just as I made the front of the line and I was happy to receive it on request. It was outstanding. 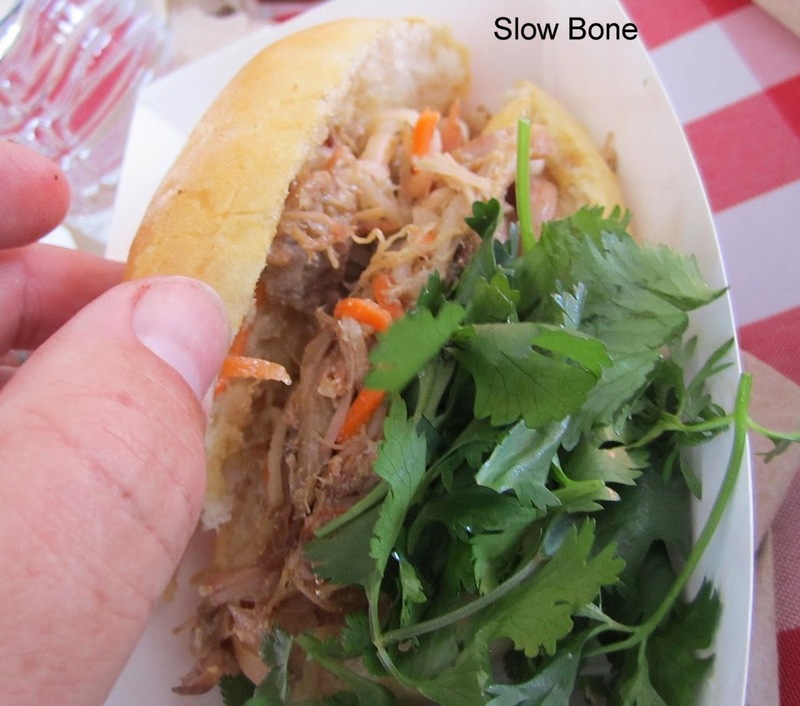 Jack was offering little pulled pork sandwiches from Slow Bone with some tasty home made bread. 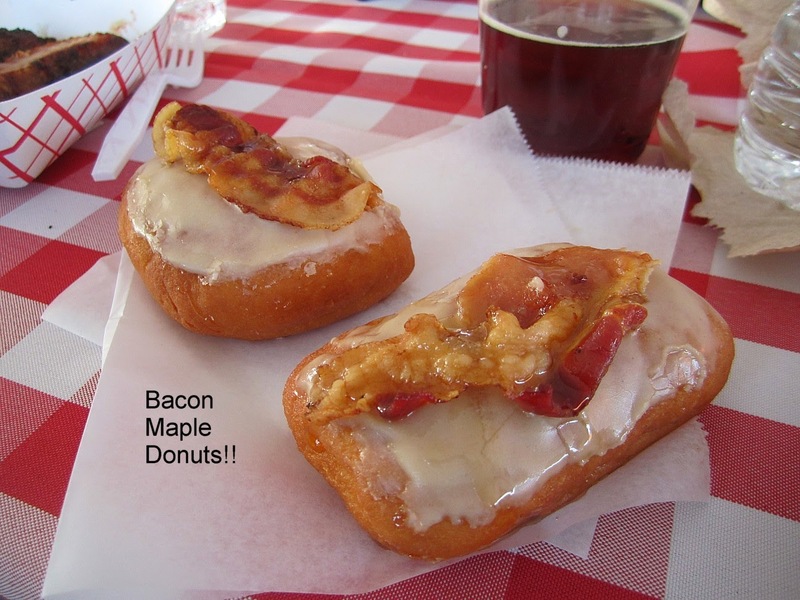 We finished things off with a delicious bacon maple donut! A great finish to a beautiful day eating wonderful food for a good cause. 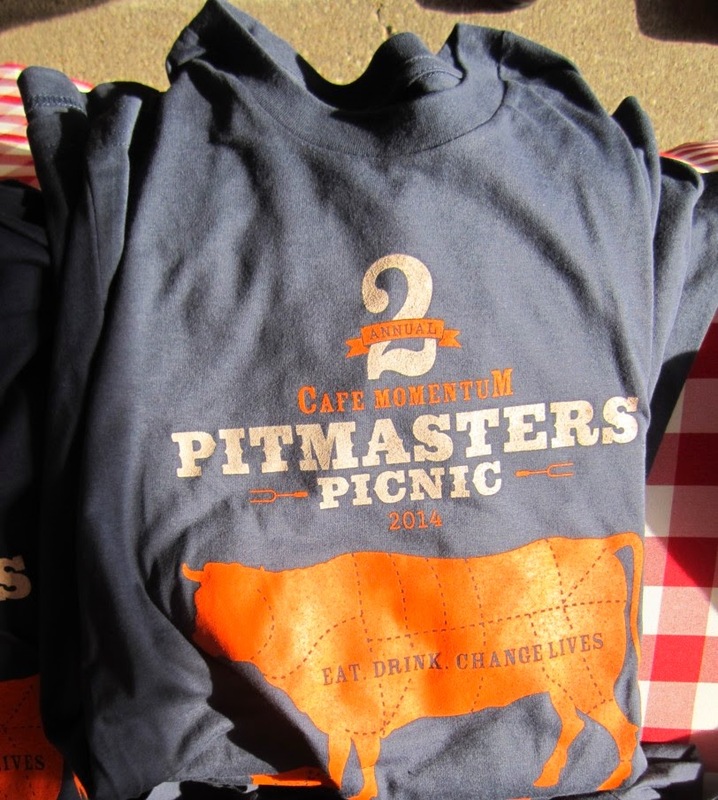 Click on the link at the top of the page to donate to Cafe Momentum and read about what they do. A few more photos from the event in the post below. Trey joined me on this trip and we showed up a few minutes before they opened at 11 am. We were 4th and 5th in line. I have definitely seen worse. :) They opened up right at 11 am and we waited a bit as they scrambled around to get various things that were not quite in place. 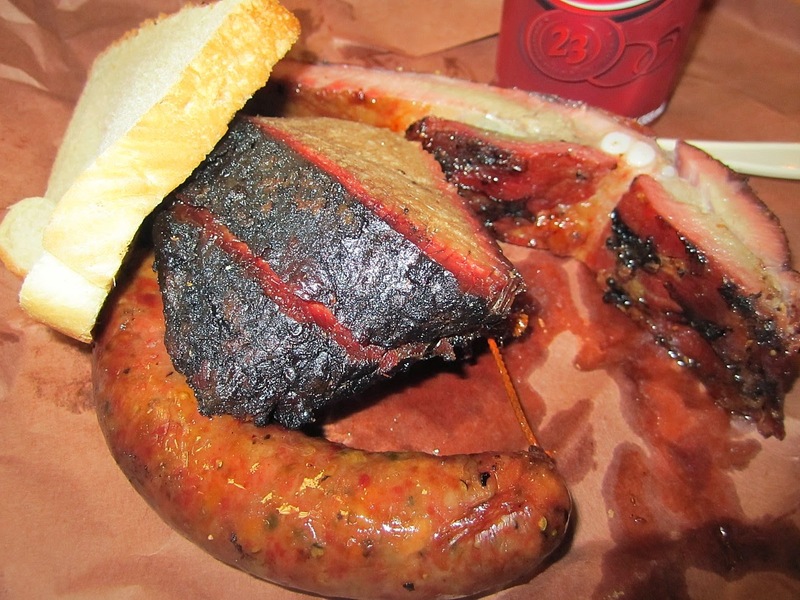 I ordered 1/2 pound of moist brisket, 2 spare ribs, and 1/4 pound of jalapeno sausage. 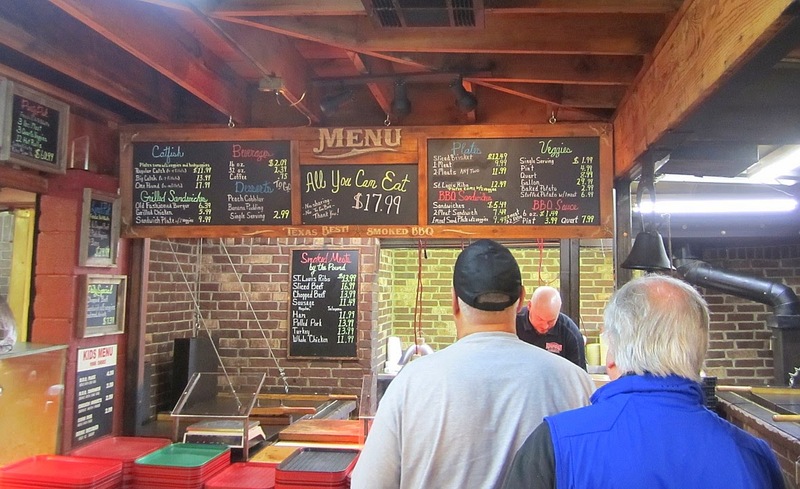 They have 2 meat plates, but I always prefer to order by the pound when I can. Especially when I can't get a 3 meat plate! I think if you serve 10 meats, you should offer a 10 meat plate because there's always going to be people who want to sample everything. All the food looked great and seeing did not deceive. 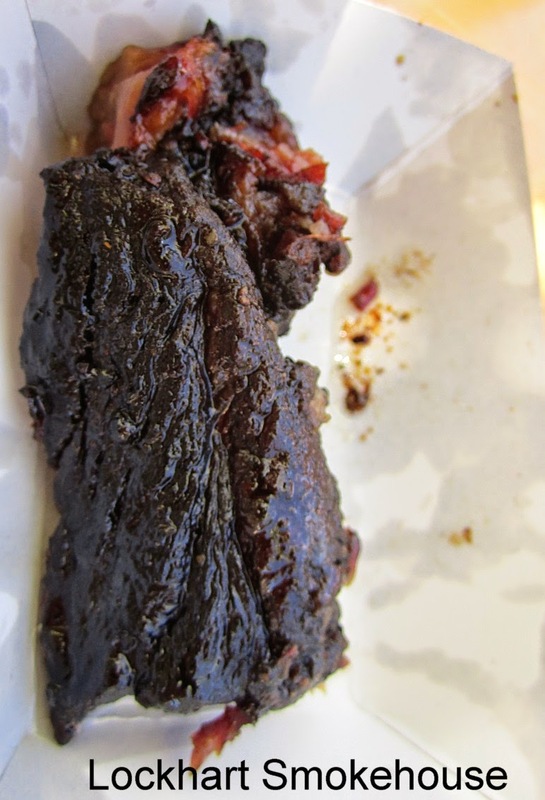 The brisket was very moist with well rendered fat. The smoke flavor was light but certainly present. 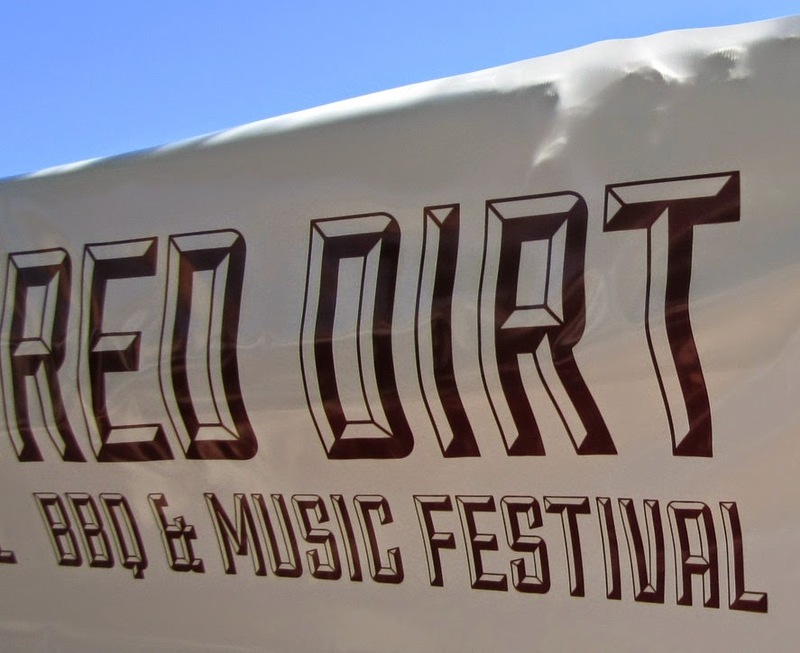 The ribs were nice, with the slightly crispy crust which I had noticed at Red Dirt. They had a caramelized light glaze which was coated with a fresh application on cutting. 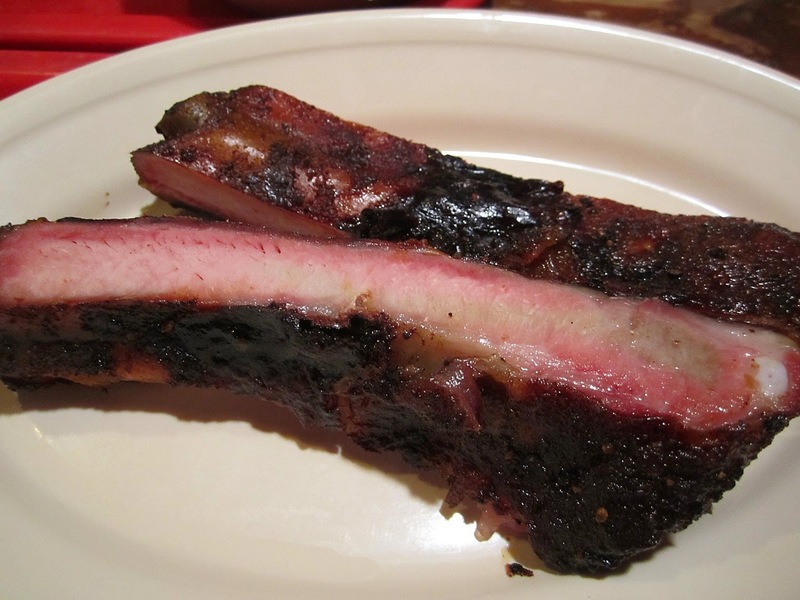 The ribs were tasty with good tenderness and moisture that left a good bite mark. 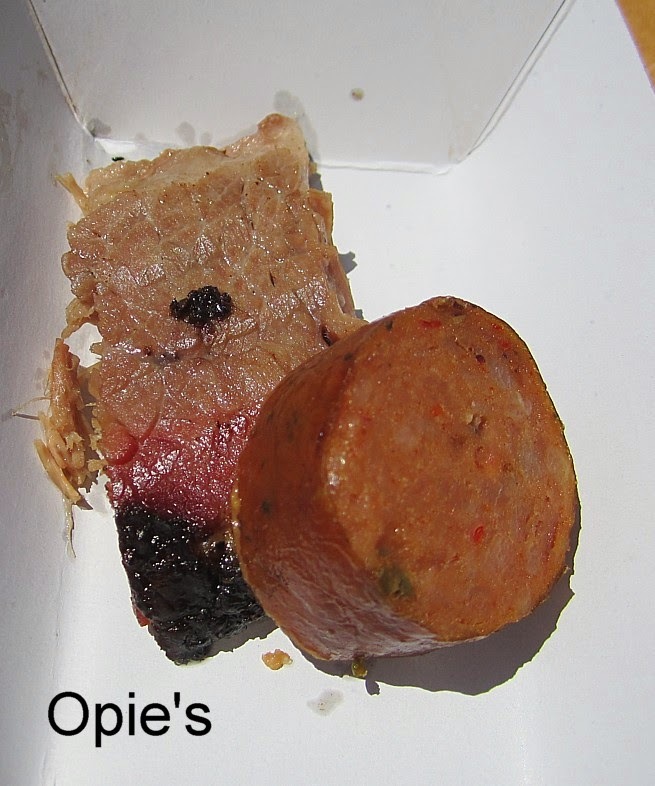 The sausage was hot and juicy with only light jalapeno flavor. A very nice meal for the price and well worth a stop if you're in the area. I may have to fast and go back for their $17.99 all you can eat some day. 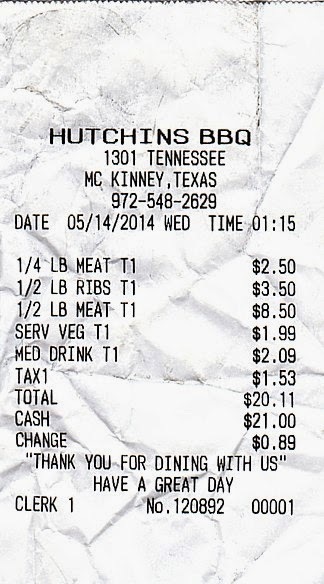 That's a pretty good deal for some very good BBQ. 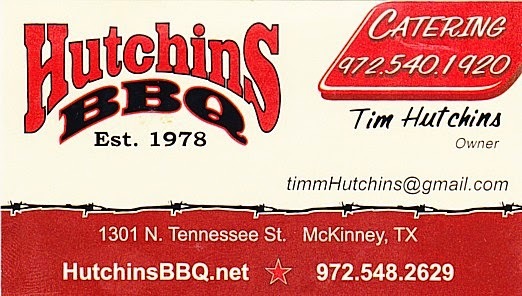 This place can give Lockhart and Austin a run for their money. 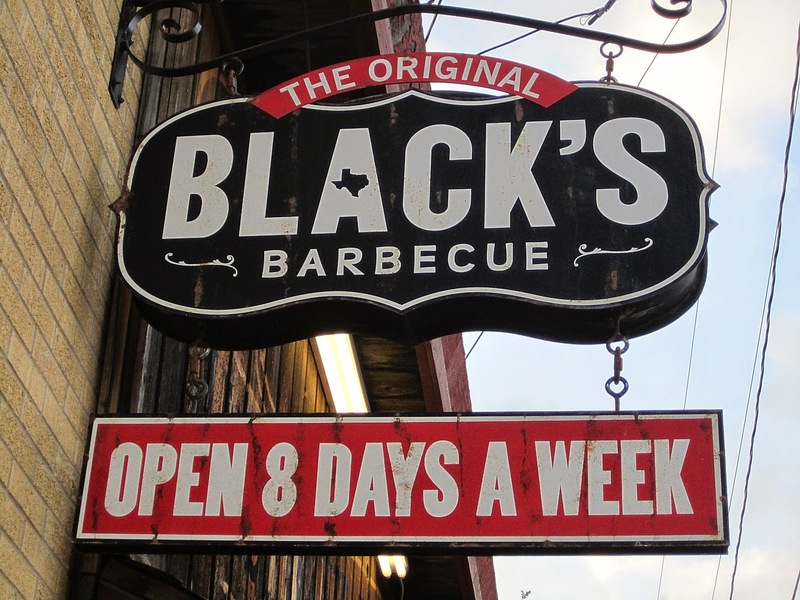 I received an interesting e-mail from a publicist inviting me to be part of the tasting audience for a new TV show filming at Black's BBQ in Lockhart on Monday, May 12. Scott was busy, but my buddy Dave was able to join me on the day of. I can't say anything about the show until after the episode airs, but I did have a few other adventures on the trip. More on the TV show later, probably end of the Summer. 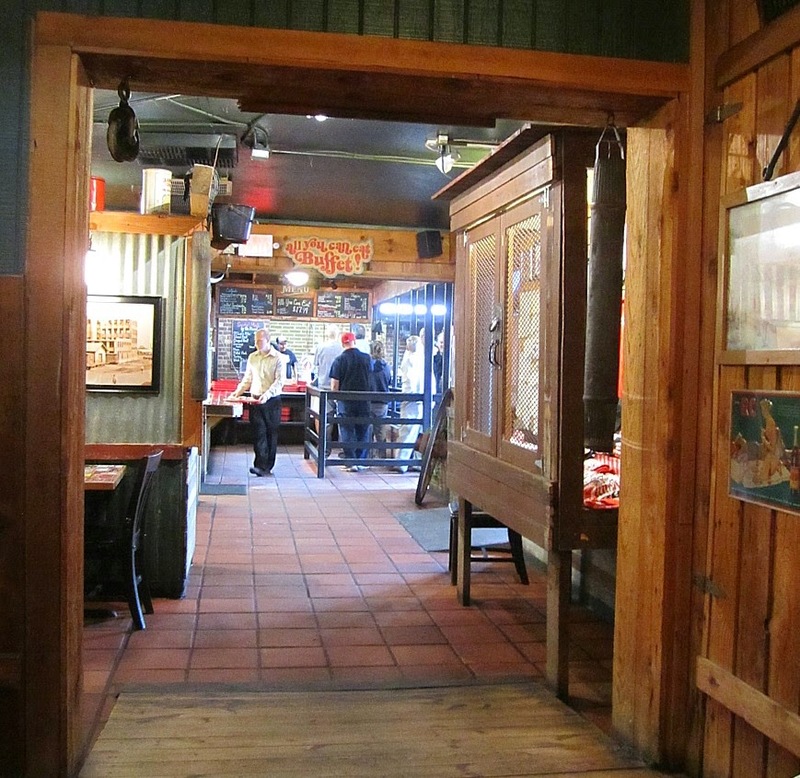 I headed down Sunday afternoon with plans of a nice leisurely dinner at Black's. 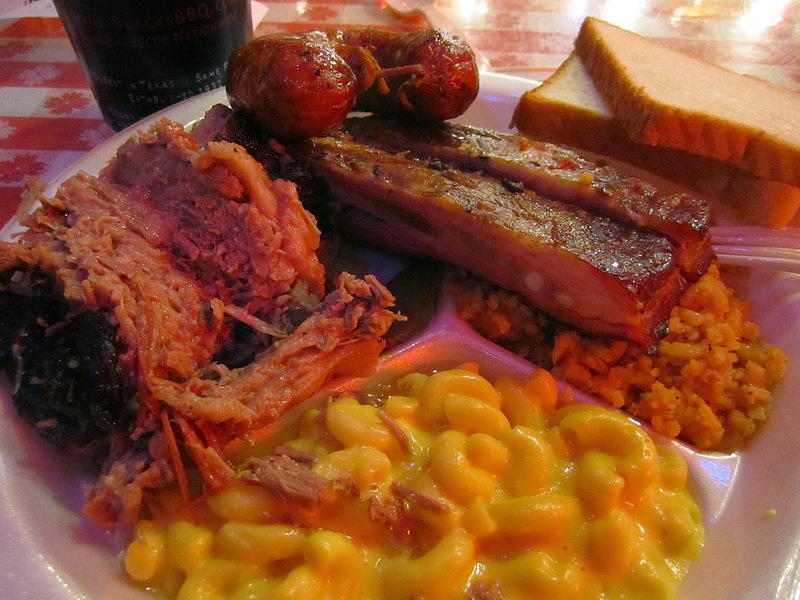 I figured things would be pretty fractured with the filming on Monday so I wanted to get a good BBQ feed that evening. After long delays on I-35 in Temple, I finally pulled into the parking at the restaurant at 7 pm. For the record, it is 238 miles from my driveway to Black's, via the Pickle Parkway. 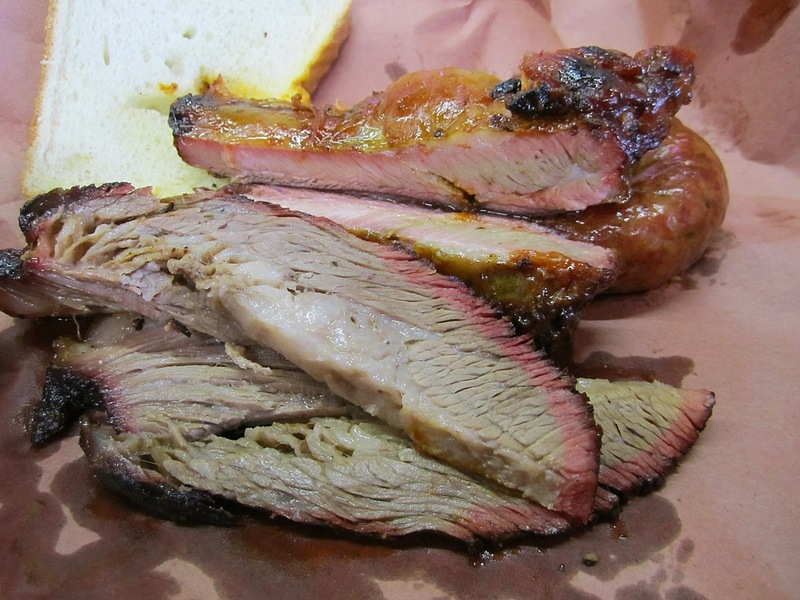 I picked a quiet corner and wolfed down my usual 1/2 pound of moist brisket, 2 spare ribs, and a jalapeno cheese ring. The photo doesn't do it justice as I was back sitting in a corner by a beer sign that cast a red glow on the photo. Guess I needed a flash. Oh well. 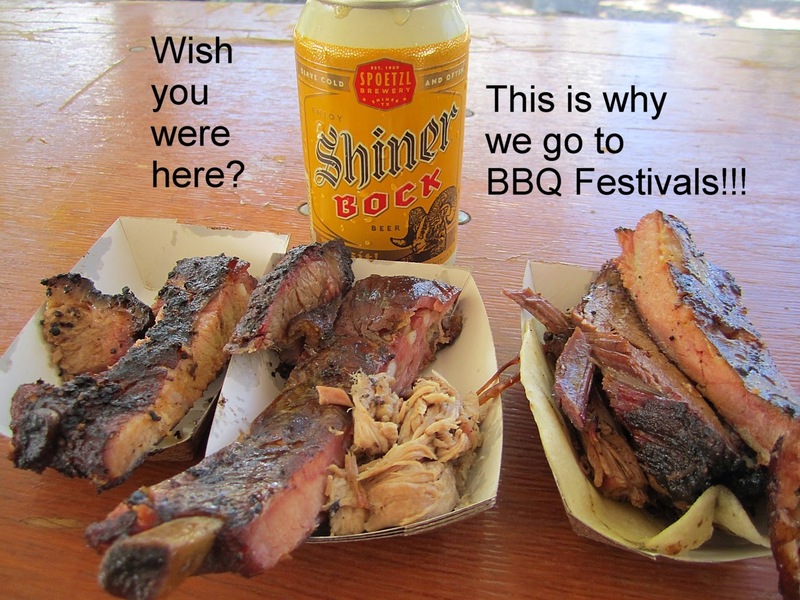 Take my word for it, the meal was excellent with moist tender brisket, good smoke, and perfectly rendered delicious fat. 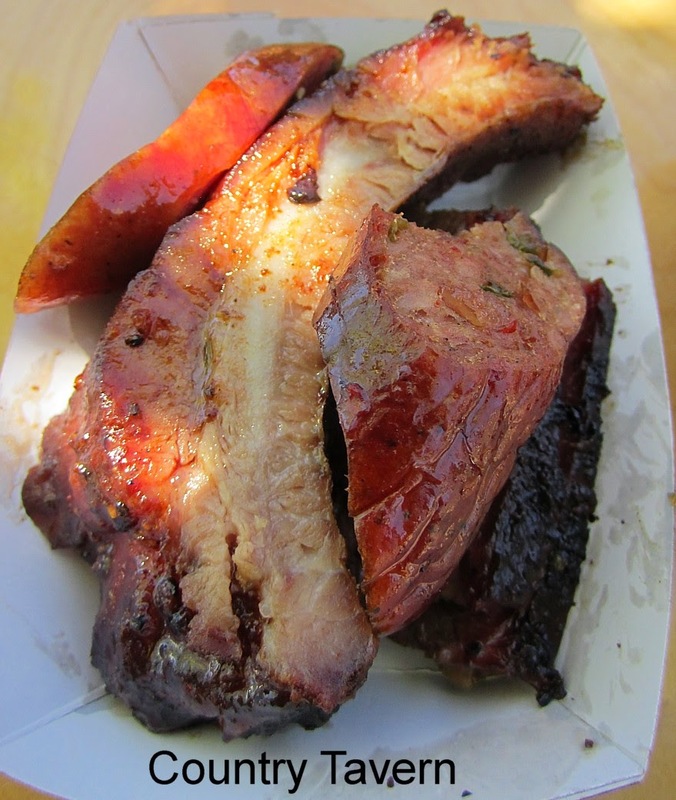 Ribs were spot on and the jalapeno cheese ring was fine as always. The next morning the call time for the TV shoot slipped from 12:30 to 1 pm which meant I had a couple of hours to kill after checking out of the hotel at 11 am. I thought briefly about getting permission to hang around my room and check out a little late, but I figured I was in Lockhart so I might as well take advantage of that fact!! 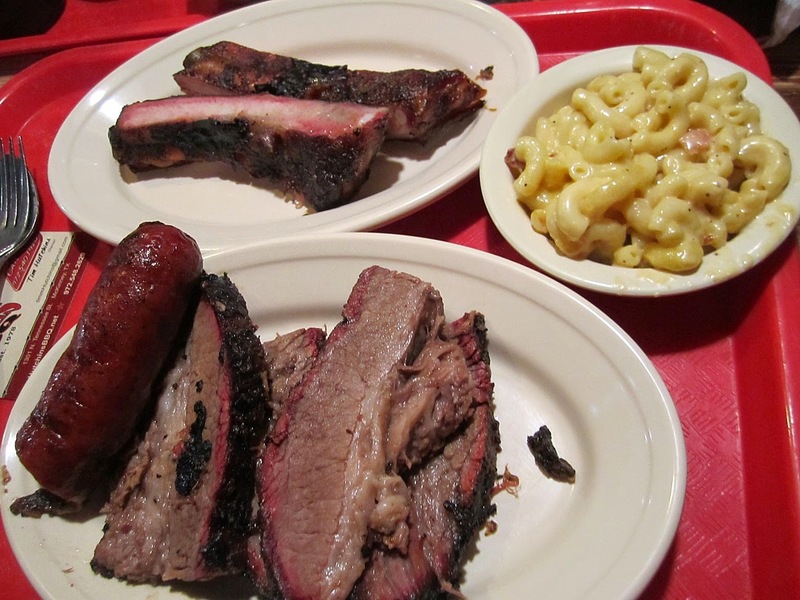 I decided I would get small meals at Smitty's and Kreuz just to see how they compared to what I got at Black's the previous evening. Now this is a comparison I have made many times before, but it never hurts to give everyone another shot. Originally I had planned to recheck Chisolm trail too, but their parking lot was full, as it always is. 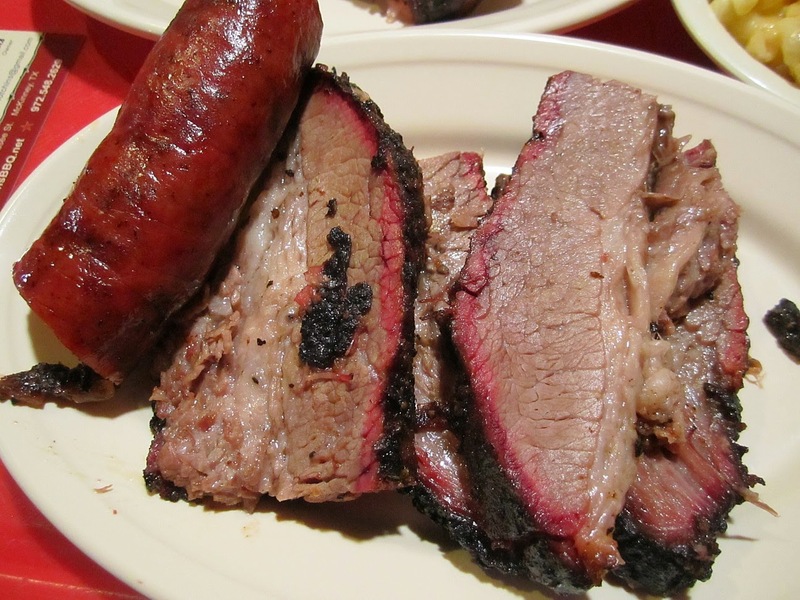 On to Smitty's where I got 1/3 pound moist brisket, 2 pork ribs, and a hot ring. Sad to say nothing much has changed from my previous visits. 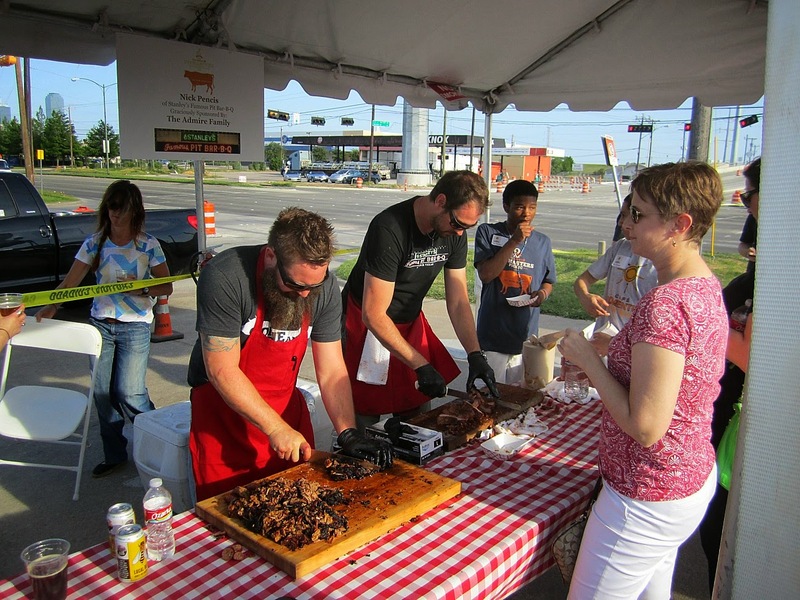 The brisket was underdone with unrendered fat and failed a pull apart test. The ribs were tuff and chewy. The ring had good flavor but was still too wet for my liking. I keep going back to Smitty's but they just seldom have what I'm looking for. 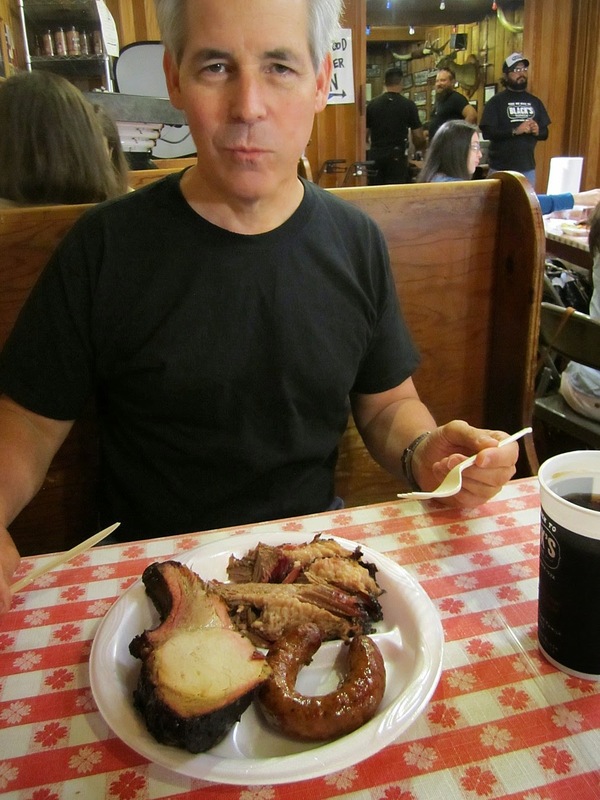 On to Kreuz Market where I ordered the same, except just 1 rib. 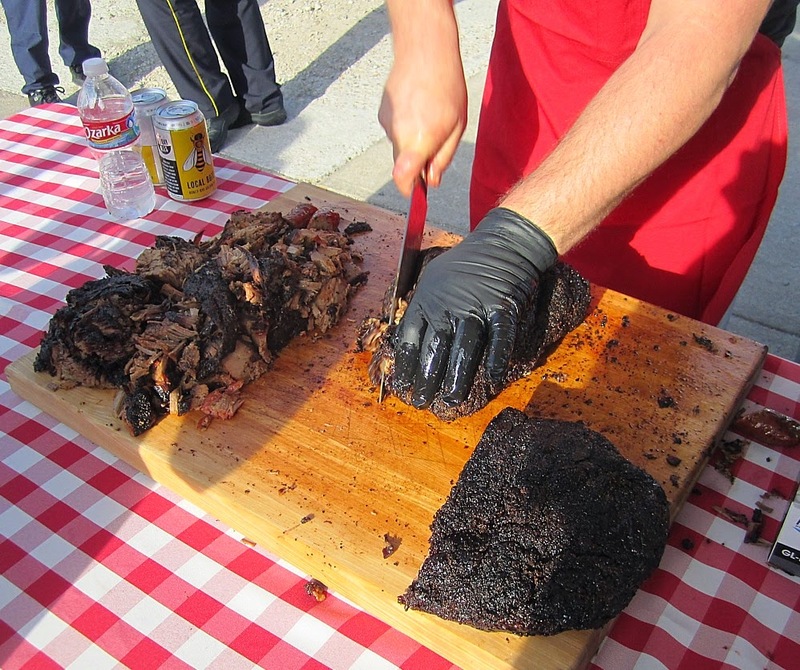 They pulled out a fresh brisket, a beautiful sight, and I got two nice slices off the lean end. Beautiful looking brisket. It was a little crunchy on the outside but good flavor and moist inside. Just no discernible smoke flavor. I know it is sacrilege, but I think it needed a little sauce. 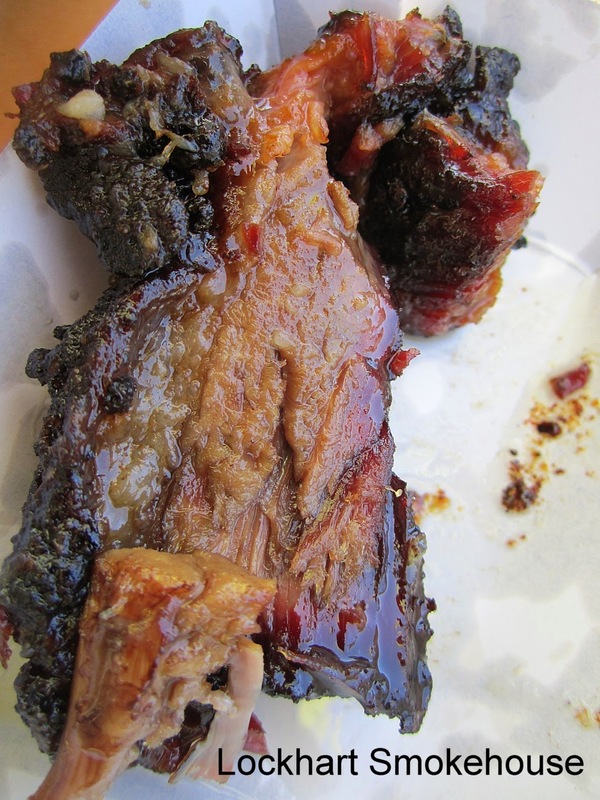 The rib was very nice with good moisture, tender, and a good bite mark. None of the toughness at Smitty's. The jalapeno cheese ring was awesome, as always. I still have a case of their excellent sausage in my freezer so no need to reload this time. 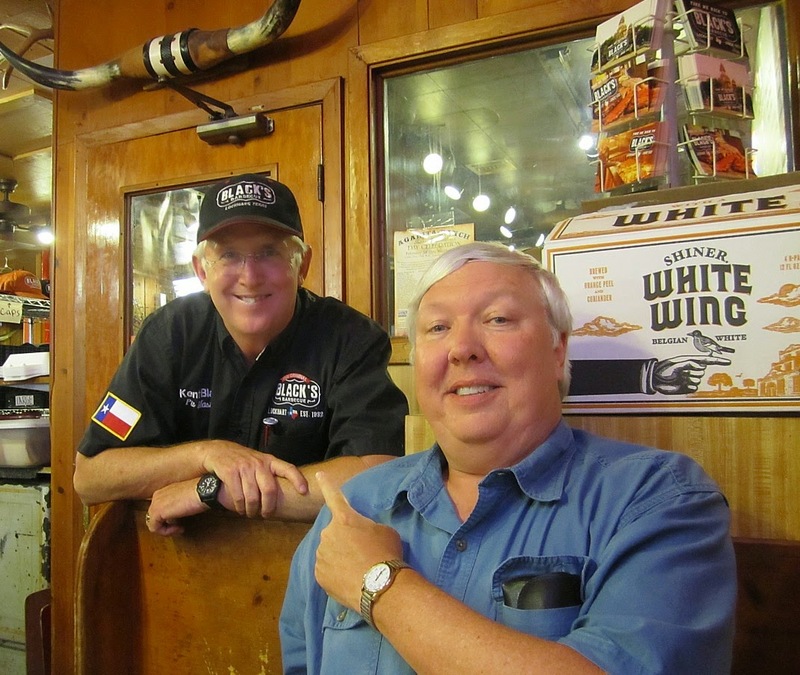 My Lockhart rankings remain the same, Black's, Kreuz, then Chisolm Trail and Smitty's. 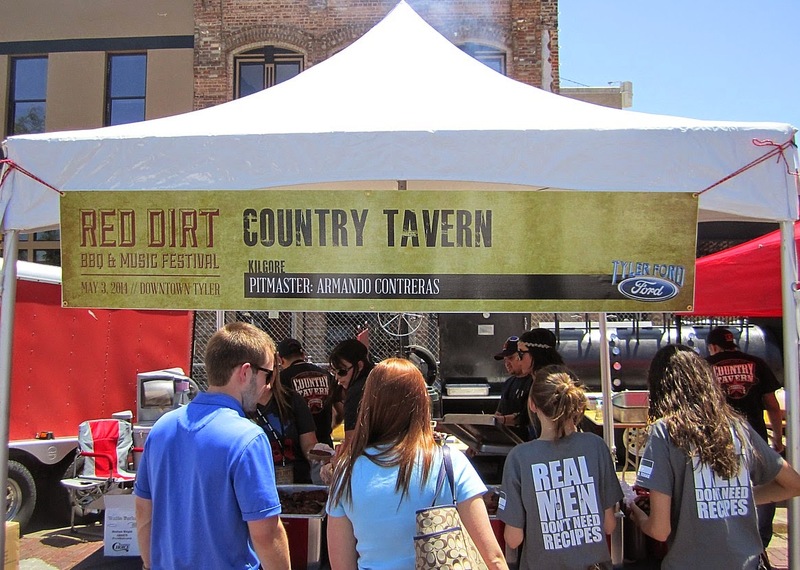 I have yet to be there on a weekend to check out the new trailer, Mad Jack's. I eventually wandered over to the TV filming and I will blog about that after the episode airs. Dave joined me and we had fun visiting and speculating on the event to come. Dave had a Black's meal while we waited and he raved on the porkchop. Brad and John from the Man Up blog were seated at our table for the show and we had a good time visiting. Drew came by later with his tour group, but we were still filming so we didn't get to visit. 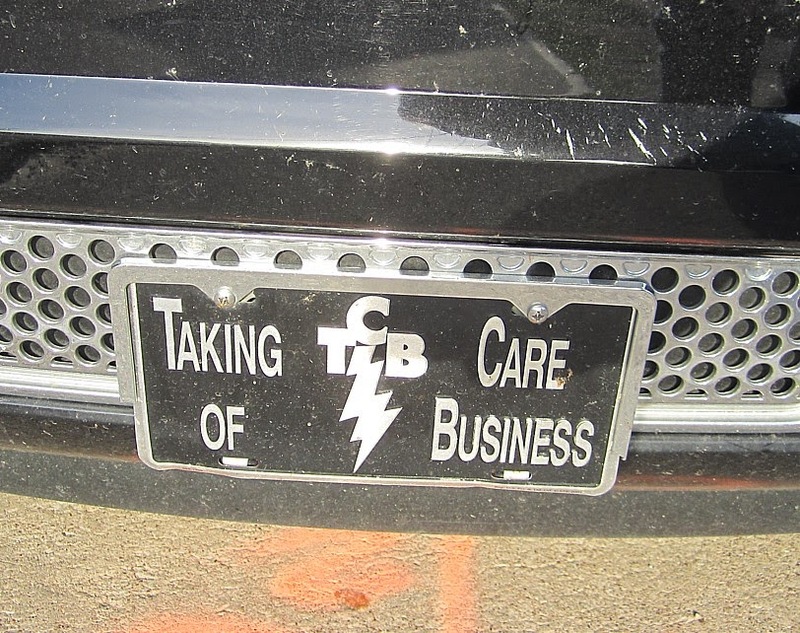 During part of the down time Dave and I had a nice short visit with boss man Kent Black. They were wonderful hosts for the event. They continued to serve customers through the whole show, which was pretty amazing. 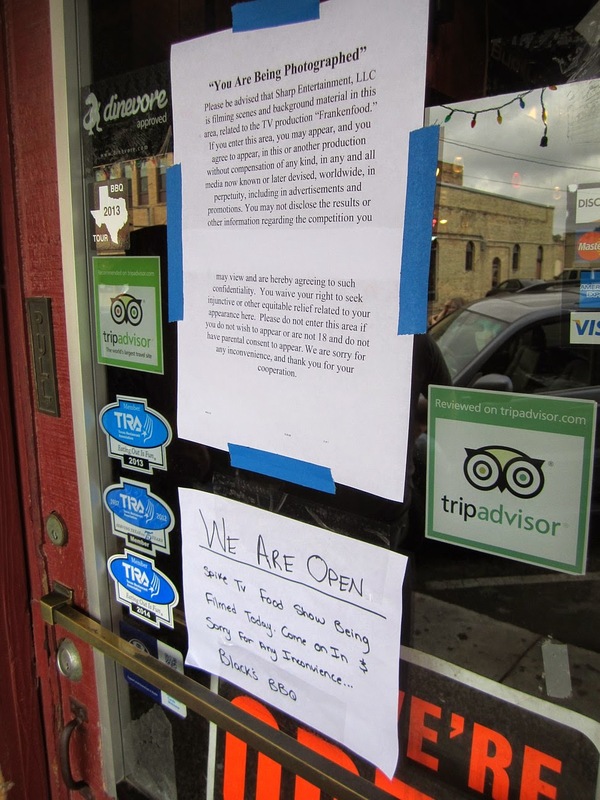 Nothing stops Black's from serving great BBQ. 8 days a week! More on the TV show later, when I can. It was fun. My what a great time we had today. After a short drive to Tyler from DFW, we checked in with our VIP tickets about 30 minutes before opening. Scott's reservation seemed to be missing, but he had his ticket and they found a goodie bag for him, even though it didn't have his name on it. 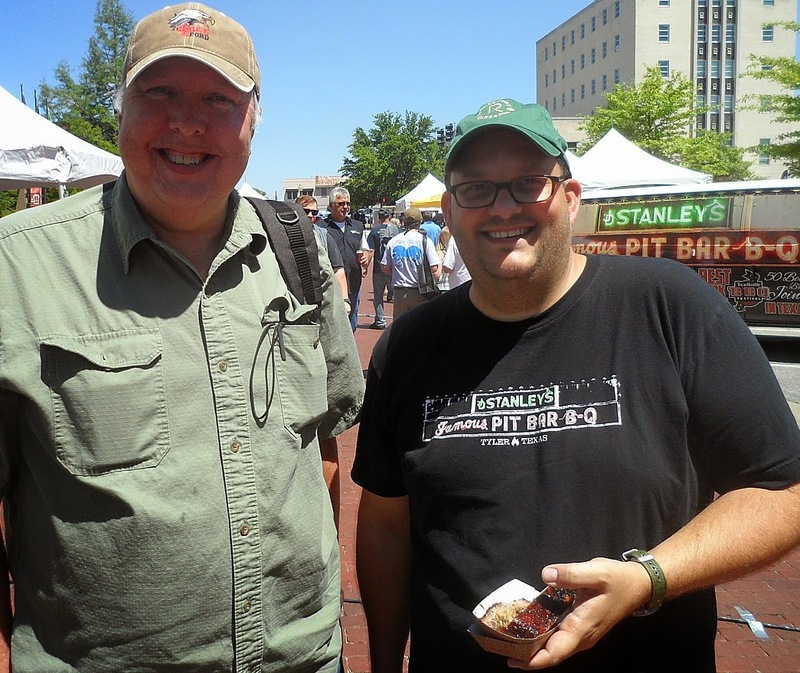 As we waited for the fest to open, we hung out in the shade and talked with some nice folks from Shreveport as well as two of the organizers from the Houston BBQ Fest, from which Scott happened to be wearing the shirt. Things kicked off right on time with VIP entry at 2 pm. Scott and I split up pretty quick and started running from tent to tent gathering meat. We quickly noticed that there were no paper towels at the tables, which was a bit of a problem, but I had packed my own towel for just such an occasion. 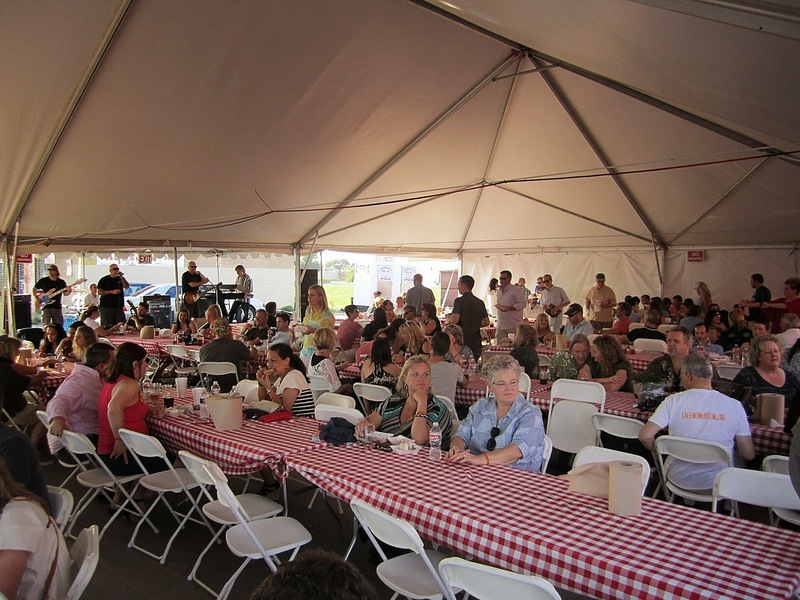 There were napkins at some tents and there were also paper towels at the hand wash stations, but a Q fest where most people are eating with their fingers really should have some paper towels or napkin dispensers at the eating tables. One of the few negatives at this very well run fest and a simple 1st year mistake that can be easily corrected next year. As I went from joint to joint I was very very impressed with the quality of the BBQ. 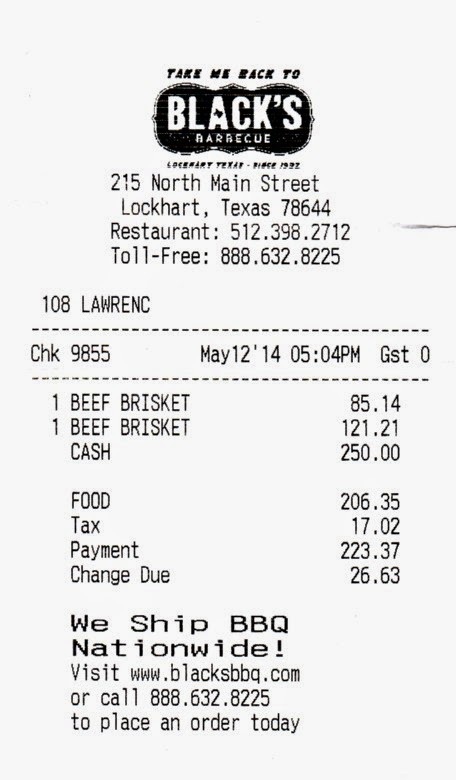 There was not a single piece of brisket that was undercooked. 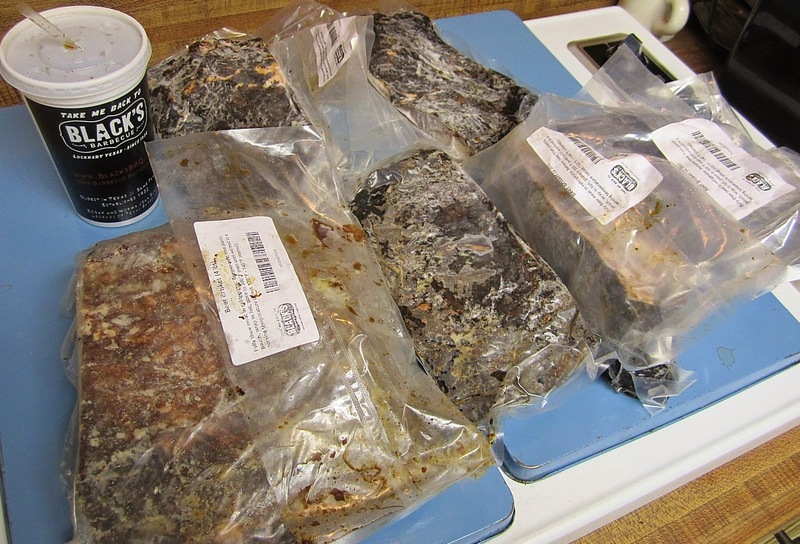 Every piece of fat I got was well rendered and flavorful. 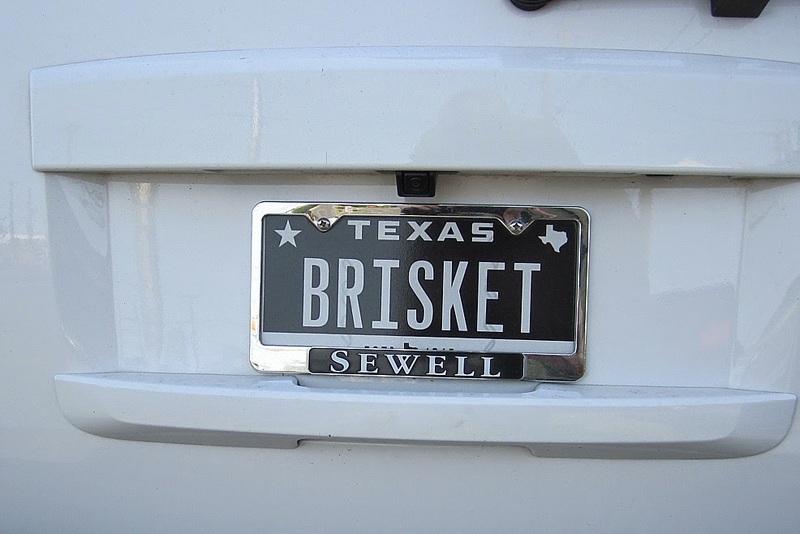 Only 2 brisket samples were overcooked to slightly mushy. 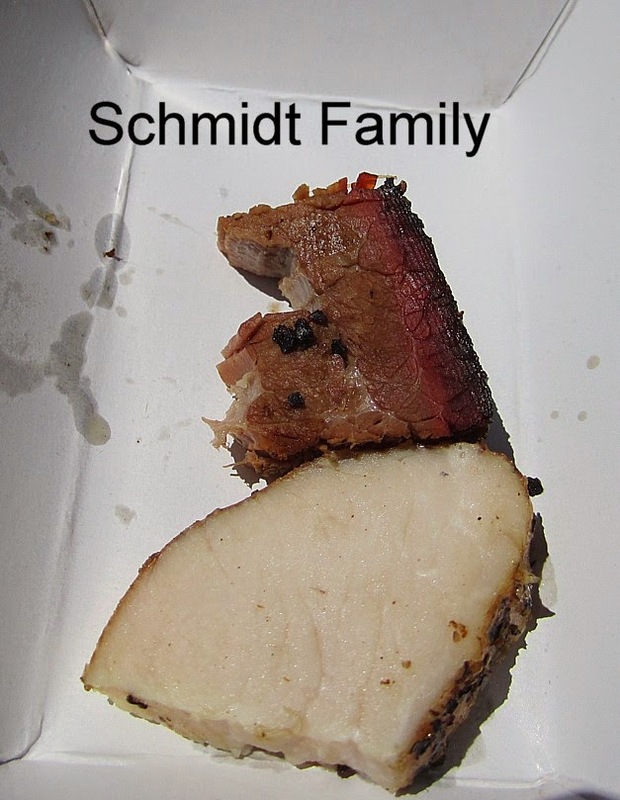 Smoke flavor was present in almost every bite of brisket. 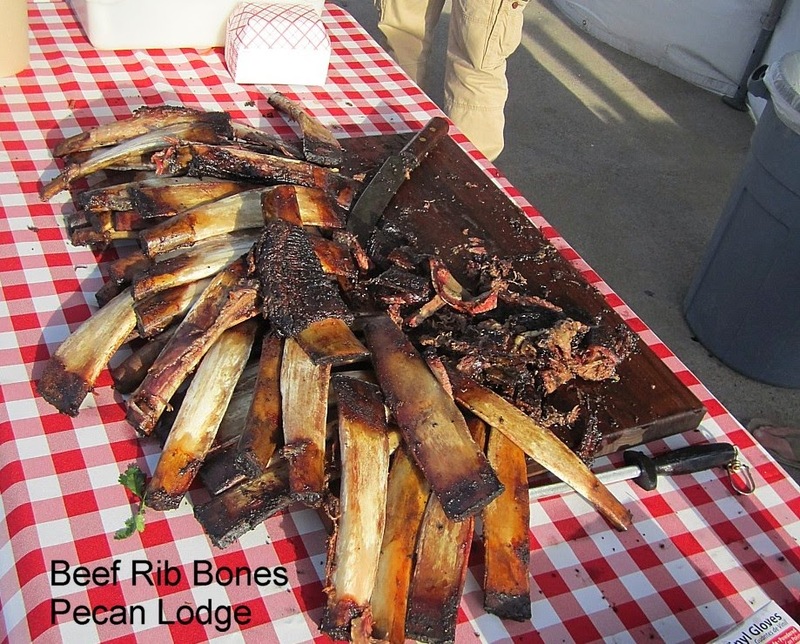 Not a single rib pulled off the bone. Most left perfect bite marks. 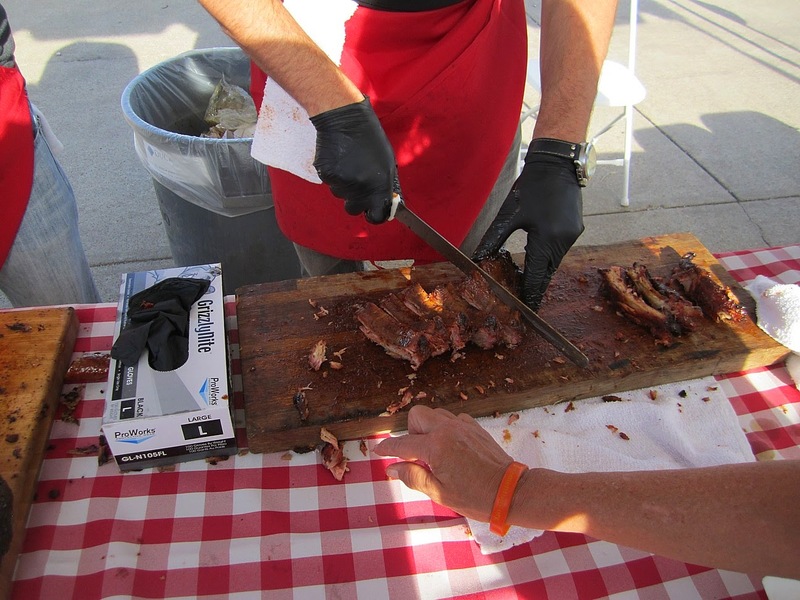 Only one rib I sampled was a bit tough. All of the sausage was good to great. It wasn't long before I pulled out the plastic bag and started saving all my leftovers. Very little meat was thrown out on this trip and I can enjoy this fest for a few more days thanks to my little ziploc bag. We ran into Daniel and he seemed to be having a good time "working" the event. 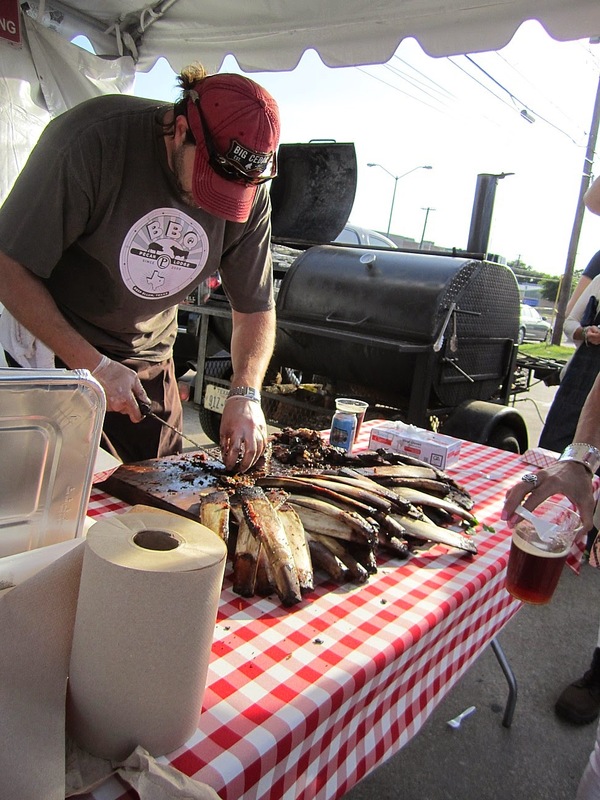 I did notice he got more BBQ than I did at a few booths where I was behind him. Hmmmm. Scott tried to talk him into a photo feeding me a rib, but he wasn't letting go of his rib for anything. Ah, a man like me. Hah! Thanks to Scott for the photo. The VIP price was well worth the extra expense as lines were very short to non-existent. I used my 2 drink coupons for some Shiner Bock and it went down mighty nice with the excellent Q. Scott went off in search of some soft drinks and returned with free ice cold samples of "Dr. 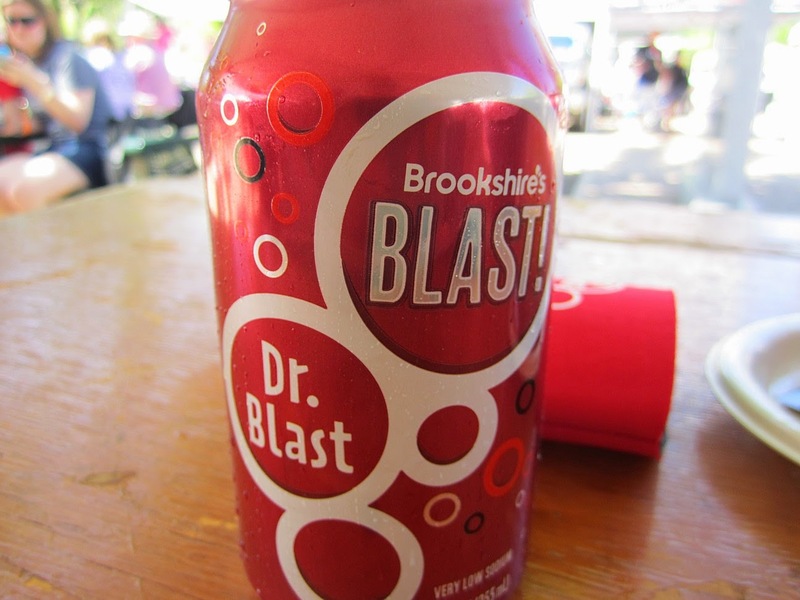 Blast" from the Brookshire's booth. Good stuff. One of the better Dr Pepper clones I have had. The free soda was even better when the general admission hordes descended at 3 pm. 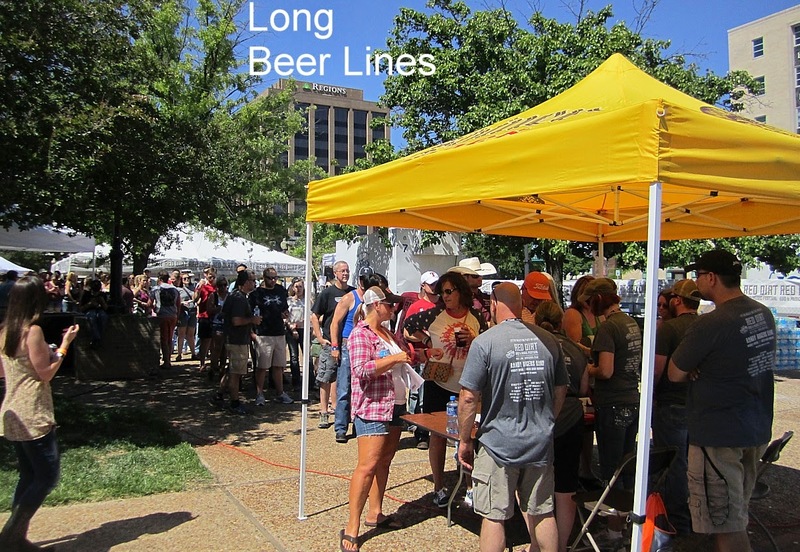 It seemed like the lines to purchase beer tickets immediately stretched out to great lengths, despite the presence of several such booths. The wait at the beer tent itself never seemed very long, but the wait to get beer tickets was. In contrast Brookshire's was handing out free soft drinks with no wait at all. What a great promotion. 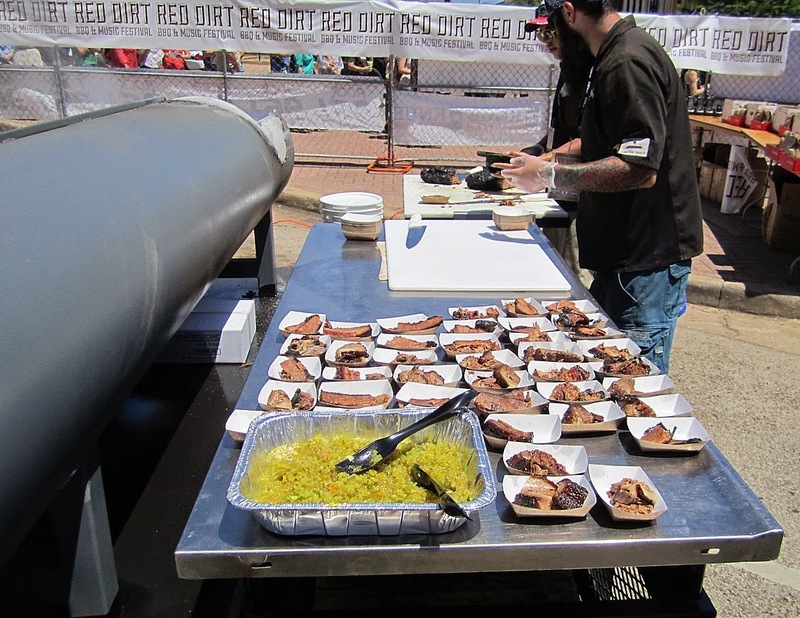 Back to the BBQ, it is hard to pick out the winners from such a quality field, but I think I would choose the rib I had from Hutchins BBQ as my favorite rib of the day. Nice bite mark and flavor, but the standout part was a slightly crispy bark on the outside. Almost like a grilled finish. 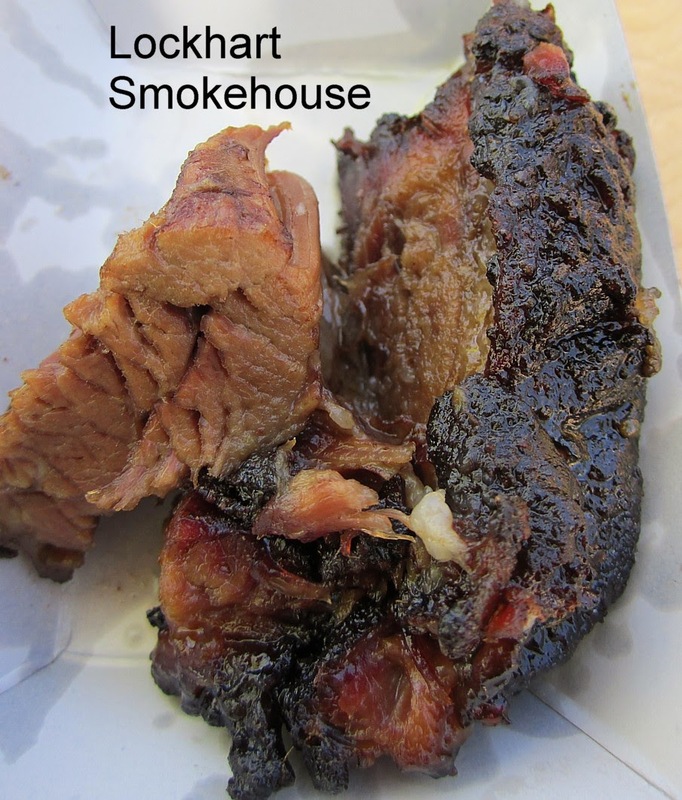 My favorite bit of brisket was a killer burnt end from Lockhart Smokehouse. There's more than one photo of that below but don't view the enlarged photo unless you want to get real hungry. 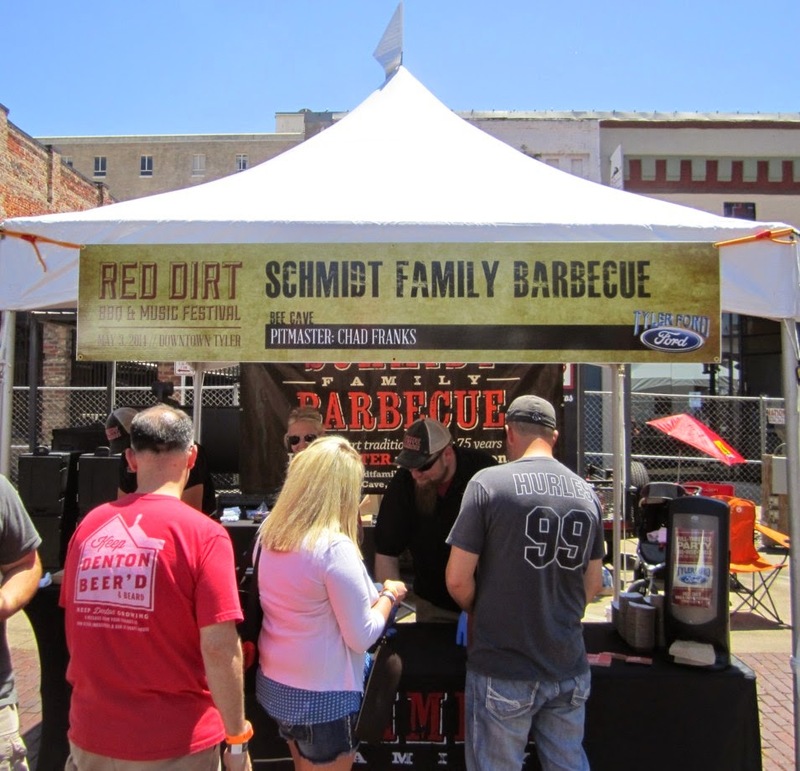 Louie Mueller's sausage was my favorite of the day, but I have to say there was a lot of other good sausage as well. 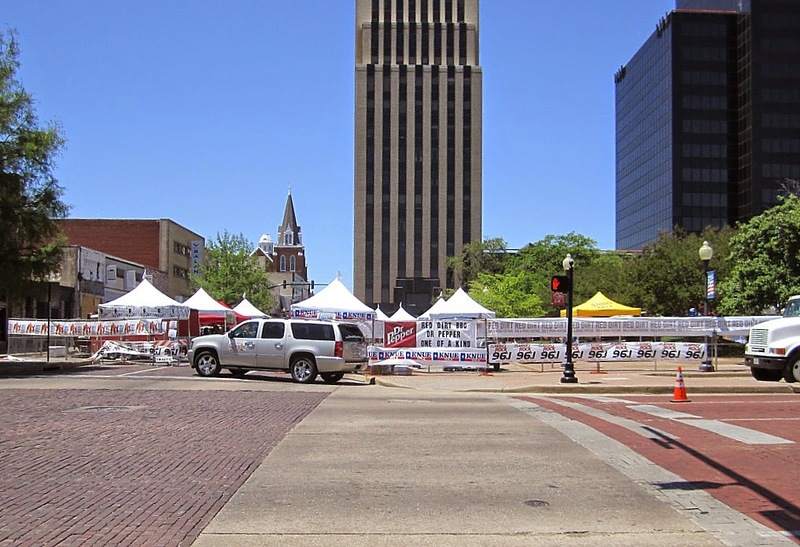 For a first year fest I thought the organizers pulled off a great day. 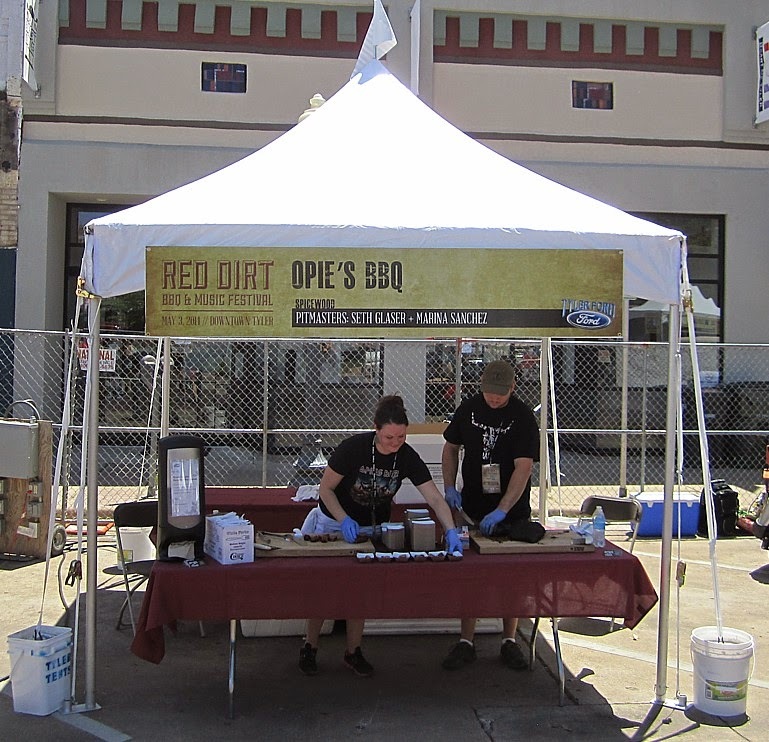 We didn't hang around for the music festival, but I can't wait for more BBQ next year! I suspect Scott and I will be back to East Texas before then for a tour or two. 3 sets of fest photos below.